Upon first impression, the colorful world of a young boy living inside a Paris train station hardly seems like the sort of material that would come to the attention of Martin Scorsese. Traditionally driven by the cold realities on the mean streets of the big city, his is a pattern of more serious sensibilities, and not at all brought to fruition by the simple pleasures or characters possessing mere hope and confidence. But then there is a revelation of stirring importance that rises to the peak of our awareness, and a critical connecting point emerges. Reflecting his impassioned crusade for the continued preservation of film heritage, the story ultimately becomes a fable about one such discovery (and certainly one of the most enriching) falling into the hands of inquisitive youths. So harmonious are those links that once our eyes awaken to the truth, alternate scenarios feel like nightmares, even betrayals. What other filmmaker – dare we say even the most visual or artistic – could have shown so much love for a subject this precious, or enveloped it in such a passionate embrace of careful technical values and stirring emotional undercurrents? 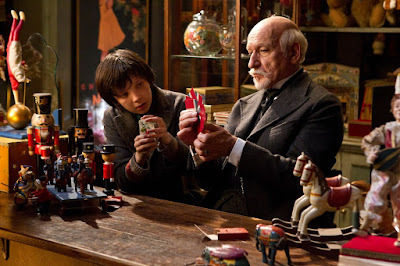 Among an elite cluster of resonant movie fantasies of the recent years, “Hugo” is the most accomplished of the lot, a gorgeous, moving and amorous love letter to the very cinema it is born from, and a celebration of the youthful wonder that is concealed in everyone – yes, even those of us resolved to the cynicism of adult thinking. Discovered in the form of a popular book penned by Brian Selznick, Scorsese apparently felt dual obligations in adapting this story to the screen; beyond its thematic synchronicity, the director approached his endeavor as if delivering a precious gift to his young daughter, the person who first dropped it in his unknowing fingers. What she had also done, in effect, was set the stage for his most symphonic foray into the exciting world of movie magic. Like “Moulin Rouge!”, this is a film that filters familiar elements into a display of nostalgic purity, and like “The Wizard of Oz” it invites us into an enchanting realm of characters that is as complex as it is life-affirming, even when it has no particular reason to be. The story begins not in details, but in observation. As the camera strolls briskly through an elaborate train station in Paris – done so in a brilliant tracking shot that begins high above the skyline and ends on the face of a clock – it discovers a place rushing by with strange and fantastic experiences. A young boy with vivid blue eyes named Hugo Cabret (Asa Butterfield) stands cautiously at the center of these silent marvels, and his story is a fascinating mixture of melancholy and wonder; left orphaned by a deceased father and an uncle always missing in action, he wanders silently through the walls of the train station like a young Quasimodo, keeping the depot’s many clocks consistently running while observing, cautiously, the busy faces moving past him. One of his more notable subjects is that of an old toymaker named Georges Méliès (Ben Kingsley), whose shop rests at the end of an immense hallway and is filled with marvelous and inventive gadgets. Unfortunately, Hugo has not exactly been the most strategic face of curiosity when it comes to the old man’s treasured merchandise, and when he attempts to thieve away a toy, the old man is right there to catch him. What he doesn’t know – at least in full scope – is that Hugo is acquiring these toys for spare parts, hoping to find a missing key (or gear) that goes to a mechanical man stashed away in the station’s attic. In flashbacks we see this “Automaton” brought home by Hugo’s kindly father (Jude Law), but the mystery of his functions are sidelined when dad is killed in a tragic accident, leaving the device entirely in the possession of his intrigued but grief-stricken son. A hunt for the missing link to that mysterious silver man is all that Hugo has left in retaining some semblance of a rapport with his deceased parent, and when the toy dealer discovers a journal in his pocket containing sketches of the mechanical creation, he reacts with shock, then sadness, and then outright anger. What does he know of the Automaton, and why does he regard Hugo’s discovery from a place of such resentment? The key link between both truths is Méliès’ own god daughter Isabelle (Chloe Grace Moretz), who befriends Hugo one night when he follows the old man home to recover the journal taken from him. The relationship between both young dreamers functions both as an emotional current as well as an artistic contrast. She is a devout reader of classic literature – shown implicitly in a scene where she wanders a library owned by a stern-looking patron (Christopher Lee) while reciting famous quotations – and he is a fan of the moving pictures, introduced to him by his father. Both mediums are the outlets in which they find consolation in a real world made mystifying with hazy adult dilemmas, and yet inevitable cross-overs become necessary to decipher what is impending: the prospect that this Automaton must contain information as valuable to Hugo as it is to Méliès, and perhaps the cranky old toy seller is not everything he seems. The mysteries converge dramatically in a story that plays through the details with mannered precision, and John Logan’s screenplay colors the edges with small but effective subplots occurring within the train station (including a poignant one involving a menacing inspector played by Sacha Baron Cohen trying to awkwardly woo the station florist). None of this would be necessary in most adaptations of such a steadfast narrative, but “Hugo” isn’t content with just offering the minimum requirement. There is a busy world out there full of strange and intriguing personalities, and many of them wander through that Paris station with implicit focus. Likewise, they are surrounded by the gift of technical artists who create one of the most thoroughly vivid production designs I have ever seen. There is not a single frame of the movie that lacks thorough vision. The opening shot, a brilliant use of visual illusions, shows a town square in Paris shaped like the gear of a clock. A later moment involving a zoom-out of Hugo’s face peering through the clear glass of the station clock emphasizes the enormity of Scorsese’s scope. The film’s color palette is drenched predominantly in hues of blue and brown, which were staples of early color pictures. And the use of dreams becomes one of the key framing devices of the last act, particularly when Hugo has a nightmare about being trapped on the train tracks and must inevitably jump onto one to save the Automaton from being knocked out of his hands. But what sells these details even beyond their presence in a stirring adventure is the context in which they are anchored. Film historians will instantly regard Méliès’ name with all-knowing fascination; at first a magician who discovered filmmaking when it was still a strange novelty at touring circuses, he became one of the premier visionaries of French silent cinema, creating some 500-plus films before the onslaught of World War changed the outlook of his enthusiastic audience. Many of his works were destroyed, but some key ones – including the famous “A Trip to the Moon” – survived, forever reminding future generations of the power of filmic imagination (and his knack for making images look like dreams brought to life). His place in “Hugo” is the hook in which Scorsese’s attachment comes as a given; not only does it coincide gracefully with a stirring narrative about the discovery of lost works of art, but also functions as a key component in warranting this director’s own personal stamp. Many of his films dating back to “Taxi Driver” use characters that enjoy going to the movies, perhaps as a way to reflect how they absorb those values into dynamic routines. What Scorsese might have found instinctively appealing about young Hugo in that regard was how thoroughly he seemed to embody the adolescent chutzpah of Francois Truffaut, one of his most precious filmmaking idols. The great director spoke openly about the influence of cinema on his young heart – specifically, how it kept a troublesome kid off the streets and in the warm clasp of ideas and possibilities. His experience reflects that of many a young boy and girl who too felt a certain alienation from a world riddled in contradictions, and when young Hugo takes his new friend to the cinema for the first time, their faces are entranced in the same sort of out-of-body experience of the most vivid dreamers (the use of Chaplin in this moment is, I’m sure, not just incidental). Later, when one of Méliès’ own lost films finds its way onto a projector in his apartment, the camera dances back and forth between facial shots of four key characters – each different in what they bring to the moment, and yet all the same in their rousing joy. No greater pleasure was there than to see the upturned faces of the audience lit up by the big screen, Truffaut once said, and Scorsese’s treatment is a blatant recognition of that philosophy; those two moments are so precious they fill us with glee, and are reminders of times when we, too, were simpler sorts searching for a movie to escape into. Then, just when we suspect no greater response can be measured, a development pushes us beyond mere observation. An obligatory morsel of wisdom we take to the movies is that repeat viewings will reduce the effect of our emotional responses; though I have seen “Hugo” nearly a dozen times in four years, not once has my reaction changed when it comes to dealing with the film’s final ten minutes, an interlude of intense feeling. Beginning with a short but poignant monologue – in which Hugo insists through sobs that the inspector must “understand” what he is going through – and then concluding with a touching sequence in which the characters are allowed to celebrate their discoveries, I never cease to swell with tears. The degree of the movie’s pitch is never manipulative or contrived, but because it resolves its fundamental points with such tender strokes of honesty, we are caught up effortlessly in the implication. Young Asa Butterfield, who plays Hugo (and would go on to play the lead in the wonderful “Ender’s Game”), does not ham up the pitch with incessant melodrama; he lets his piercing eyes do most of the talking, and his dialogue is delivered not with intention, but with sincerity and innocence. Reflecting on this from a distance, I am reminded of some of the most bittersweet moments of my moviegoeing knowledge: the departure of E.T. aboard his spaceship, the bowing of an entire kingdom to four simple hobbits, the transformation of Pinocchio from a puppet to a real boy, Dorothy’s tearful goodbye to Oz, an old man flipping through his deceased wife’s adventure book and finding new secrets, and a shot of Bambi standing at the edge of the forest as his father turns and walks away. What such moments do is use pain in a context of good final impulses; they mean something because they come after exhaustive fights against impossible odds, and tap into the hidden sorcery of the most human moments of the moviegoeing experience. How, given the deep degree of effect such scenes provide, did a complex movie like this find the time to colonize our sensations when it was already so busy filling our heads with stunning images and deeply interesting characters and plot scenarios? If it is true, as Méliès first declared, that films have the power to capture dreams, then “Hugo” embodies all the emotion and magic that goes into them.